“When visiting overnight, after 2-year-old Leelee goes to bed, I always want to peak in at her, she has a way of getting stuck and tangled in things. A few months ago when they visited here, she slipped her body between the two pipes that make up the bed rail (top) and the bed base (bottom) of a youth bed but which didn’t have the netting attached after the last time it had been used. When I told her dad about it he said he had already seen her do that. I was so alarmed to see her stuck like that! She had been calling out (not crying) and they say let her “talk” it out and she’ll go back to bed. But she was wearing the bed rail like a flattened holla hoop with a bed attached. We pulled her out and thought that we could fix things so it wouldn’t happen again but it did: right away. Then we tied a bumper around those rails and she couldn’t do it. Then last week she got tangled in chords on the floor and something else got her foot stuck while she was playing in the bed room. I had bettered secure all the chords from now on. But here’s the worst one: It reminds me of years ago when we were staying over your grandma’s. Hannah (about 2 1/2) and I had to share a bed (you had the other bed and Ida was in a pack ‘n’ play.) Then I woke up in the morning with the long tie from my nightgown tightly wrapped around Hannah’s neck! Sheesh! I told everyone about it so that it wouldn’t happen to someone else that way. Who would have thought about it? Earlier that day I had bought that nightgown and thought it was great. Later I tied it in back and went to bed. But then in the night the tie made its way from around me to around her neck. She was fine, a little surprised only when I woke her up shreeking in whisper. What happened to Leelee was this. I was putting sheets on her bed and she had gone into the hall to climb on a stationary bike. She had managed to climb up onto a low flat spot where she could sit and straddle the bike, like she was riding it. Then she began to call out and I thought she was just frustrated with her new climbing spot. She would yell when she couldn’t get something to work and I saw her in my periferal, thinking, I’ll go help her down in a second if she doesn’t figure it out. Then I really looked at her and she had slipped her neck between two pipes that make up the handle for the stationary bike. They are separated just the width of a neck. About two feet up from where they start, they open up and become the handlebars, allowing her neck to drop in when she stood up on the flat spot. The thing is she wasn’t even sounding distressed, just calling for help as though she needed help getting down from a highchair. Now, we are of course getting rid of that bike but are waiting for the soon-to-be yard sale. You can bet if anyone wants to buy it I”ll tell them to watch out for that. It should not go to a house with small children! Please look around your house at everything you might have that is dangerous. Can you imagine that if Leelee had let her body slip off the bike and lost her footing (there was still a foot of room to lower herself before the floor). She could have broken her neck! One of my son’s pediatrician’s once described Lex as a “moving target”. This analogy could not be more fitting, except for the shooting part. The aim that was hitting a bulls-eye last month or last year might not even land in the outer ring today. 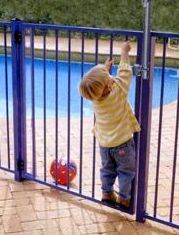 Childproofing is no different. Just because we ambitiously childproofed they home with Lex started crawling does not mean that it is any where near adequate for a four-year-old that knows how to start up computers, open up hot water faucets, and turn on the dishwasher. Having said this, no amount of childproofing will substitute for regular adult supervision, instruction, interaction, and correction. Teach safety. Reward safe choices. Observe problem solving and attention-seeking behaviors. Regularly check on your little ones; as they grow they need more alone time, but they need to be checked on as well. 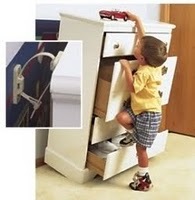 When staying away from home in a totally new environment, every corner could hold possible overlooked dangers (that probably would have been corrected at the child’s own home). Any and every present adult can help by being on alert and not leave this up to just the host or only the parents. Sadly sometimes it takes an accident to be aware of a danger. Those handlebars were probably never noticed until then.